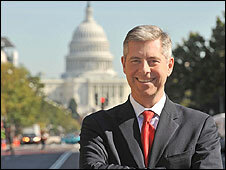 After an eventful eight years in Washington, the BBC's North America editor Justin Webb has mixed feelings about his imminent return to the UK. America was not designed to be left. The opposite in fact - it was designed to be arrived in. It was programmed to receive and - as was the case in the Eagles' song Hotel California - there is some wonderment at the front desk when you try to go. For effect, I sometimes exaggerate our sadness at the end of our time in America, result: confusion. "Our British home is in south London so we'll probably all be murdered before Christmas." "Oh, my gosh, um, why not stay?" Because you have no sense of humour, would be one answer. But it is not why we are leaving. In more than seven years of life in America, I have come to value - to love, actually - the stolid, sunny, unchallenging, simple virtuousness of the American suburban psyche. The woman who is to sell our house is a prime specimen. She is perky. Nothing gets her down, not even the fact that we are selling in the midst of the biggest depression since the Great Flood. In this area it is different. "You have a lovely home!" But she thinks we have too many books. She does not say so but she talks of creating spaces on the shelves - for snow-globes, perhaps, or silver photo frames with perfect children showing off perfect teeth. This is a cultural thing. When selling a home in America, you have to pretend that you do not live there. No, you have to pretend that no-one lives there. Or ever has. Previously owned homes are of course the norm for us Europeans. We understand that previous generations have made their mark. This means - as we English know, having grown up with rattling windows and mouldy grouting - that a home will be imperfect. They do not make such allowances in America. So the inspector's report, the survey, is the cause of much deliberation and soul-searching with our potential buyers. An outside light is not working properly. A tap is leaking. A chimney needs investigation. As I read it, my mind turns to our house in London which is actually falling down - somebody omitted to prop up the middle when an arch was cut in a downstairs room 100 years ago - but which is still eminently saleable. The English understand that we are all falling down. Dust to dust, we intuit. Americans do not. They have not got there yet. Truth be told, I would rather be them than us. I admire the concern over the chimney and the belief that the problem can be fixed. I sit on the porch, in the growing evening heat of the Washington spring, the cicadas chirruping and the sound of lawns being mowed, and yearn to be staying. It would be so easy, so uncomplicated, so safe. And yet of course - like the perfect home we tried to create - this safety is an illusion. From Washington let me take you south 600 miles (965 km) or so to the state of South Carolina. Charleston's many churches have earned it the nickname "the Holy City"
In the steamy heat of the night, cicadas deafening in these parts, breeze all but non-existent, I drove Route 17 south, out of Charleston and down into the low country, the salt marshes. 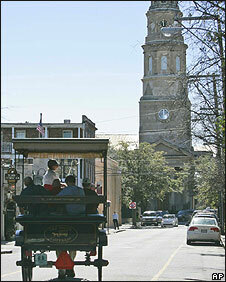 Charleston is one of America's most elegant cities, but Route 17 is not on any tourist maps, at least not as an attraction in its own right. In a sense though, it should be. It gives a wonderful insight into hardscrabble American life, the sleazy glamour of the road that repels and appeals to visitors - and indeed Americans themselves - in roughly equal measure: gas stations, tattoo parlours, Bojangles Pizza, $59 (£35)-a-night motels, pawn shops, gun shops, car showrooms, nail bars, and Piggly Wiggly, the local supermarket chain which, in my limited experience, smells almost as odd as it sounds. It is a panorama of the mundane: Doric columns a-plenty but all of them made of cheap concrete and attached to restaurants or two-bit accountants' offices. On and on it goes, encroaching into the palm forests with no hint of apology. As it happens, I am due to visit one of those forests and the following morning I find myself standing next to a black, four-wheel-drive vehicle and another quintessentially American phenomenon. A politician mired in Bible-laced hypocrisy. 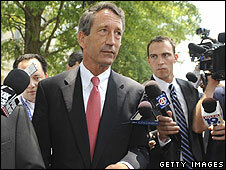 At the time I met Mark Sanford, the governor of South Carolina, just a few months ago, I didn't know about the hypocrisy. But I should have guessed when he offered to let me in to a secret. He was a closet tiller of fields, he said, and liked nothing better than to get out with his boys and work the land. A little too wholesome to be true. Weeks after telling me that all-American story, it transpired that he was also ploughing furrows in foreign fields. The man disappeared only to turn up in Buenos Aires with an Argentine woman who was not Mrs Sanford. This from a man who, when he was a congressman, lived in some peculiar Christian fellowship house in DC. It did not stop his Doric columns from being false. And yet for all the ugliness, the deadening tawdriness of much of the American landscape and the tinny feebleness of many of its politicians - for all that nastiness and shallowness and flakiness - there is no question in my mind that to live here has been the greatest privilege of my life. The immensity of America, the energy and the zest for life remind me sometimes of India. And as with India, where I spent some time for the BBC many moons ago, America shines a light on the entire human condition. Few other nations really do. Italy reveals truths about Italians, Afghanistan about Afghans, Fiji about Fijians. But America speaks to the whole of humanity because the whole of humanity is represented here; our possibilities and our propensities. Often what is revealed is unpleasing; truths that are not attractive or wholesome or hopeful. On the last day we spent in our home in north-east Washington, they were holding a food-eating competition in a burger bar at the end of our street. The sight was nauseating: acne-ridden youths, several already obese, stuffing meat and buns into their mouths while local television reporters, the women in dinky pastel suits, rushed around getting the best shots. America can be seen as little more than an eating competition, a giant, gaudy, manic effort to stuff grease and gunge into already sated innards. You could argue that the sub-prime mortgage crisis - the Ground Zero of the world recession - was caused mainly by greed: a lack of proportion, a lack of proper respect for the natural way of things that persuaded companies to stuff mortgages into the mouths of folks whose credit rating was always likely to induce an eventual spray of vomit. There is an intellectual ugliness as well: a dark age lurking, even when the president has been to Harvard. The darkness epitomised by the recent death in Wisconsin of a little girl who should still be alive. The night before she died - and she would have been in intense discomfort - her parents called the founder of a religious website and prayed with him on the telephone. But they did not call a doctor. It was an entirely preventable death caused, let's be frank, by some of the Stone Age superstition that stalks the richest and most technologically advanced nation on earth. I deplore the superstition and the eating competitions and the tatty dreariness of so much of America, and I note that the new president is also unimpressed by the infrastructure and not a fan of fat but, after more than seven years living here, I am increasingly convinced that these elements of the nation are not the flip side of the greatness of America, they are part of that greatness. Sitting in a dingy apartment in New York watching Perry Mason on the TV, you can decide to make it big in law as eight-year-old Sonia Sotomayor once did. This summer, now in her fifties, she becomes a Supreme Court justice and the latest American story to send shivers down the spines of dreamers of the American dream. 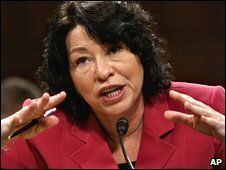 But if Sonia Sotomayor is to make it big, there must be something creating the drive, and part of that something is the poverty of the alternative, the discomfort of the ordinary lives that most Americans endure and the freedom that Americans have to go to hell if that is the decision they take. This is the atmosphere in which Nobel Prize winners are nurtured. A nation which will one day mass produce a cure for type one diabetes, could not, would not, save little Kara Neumann from the bovine idiocy of her religious parents. More than 300 million people live here now, settlers from all over the world. From Ho Chi Minh City, from Timbuktu, from Vilnius, from Tehran, from every last corner of the earth, they have made America their home and they are still streaming in. I feel crazy going back to the old world. My five-year-old daughter Clara, who is the proud owner of an American passport, agrees. She says she intends to leave home, at around 12-years-old, and return to her native land. I do not blame her. If you are willing to chance your arm, if you back yourself, if you want to live the life, America is still the place to be. Drive out on Route 17 and take a chance!